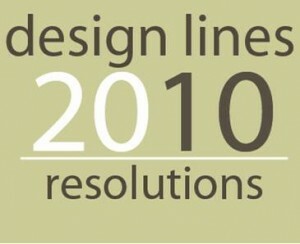 (20)10 Resolutions for a Stylish New Year | Design Lines, Ltd. The holidays are over, and now is the time to begin planning ahead to make 2010 a show stopper! Take a look at our New Year’s Resolutions, and let us help you make your space more than ready for the holiday season next year! Make work fun again by organizing your home office. Hang your 2010 calendar and buy yourself your favorite writing utensil. A Design Lines favorite is the Pilot Precise V5/V7 Roller Ball pens in classic black. Consider using a crystal glass or a short vase as a pencil holder just because you can. Get organized & surround yourself with only images or objects that inspire you. Did the flow of your kitchen this Christmas cramp your party? Now is the time to start thinking about how functional your kitchen really is, before the holidays roll around again. Outdoor living spaces can add up or may seem overwhelming but if you plan ahead and tackle it at the beginning of the year, you will be able to sit back and relax this summer while enjoying your new outdoor space. 4. You Don’t Like it, So Why Keep It? Sometimes you love everything in the room – except – that old, ugly ————————. ( you fill in the blank) So – why not go ahead and delete it from your “hate it” list and replace it with a fresh new piece or an old piece that has a new look. You won’t regret it and you surely won’t miss the eye sore. “Out of clutter find simplicity”-Albert Einstein. If your rooms feel cluttered, evaluate what you really need and simplify your life. Remove what you don’t need or don’t use! If your kids are getting into their teenage years, take a look at how your home could change to fit their lifestyle. Maybe a game room, pool table, or theater room would make your home the hang out and keep your kids within your watch. Take charge of your house and use it for what it is worth. Create rooms that work for the whole family and rooms that you will actually use. Make a list of the rooms in your house that could function or feel better, take photographs, and decide as a family how everyone would love to use them. Compare your lists and go from there. For example, you may have a formal living room that you never step foot in, consider using it instead as a music room, study, or game room! Sometimes the smallest changes in a room can make a big difference. Consider changing out throw pillows on the sofa, re-designing the family room draperies or painting a particularly boring door an exciting color. Need new accessories? Or the walls are looking dull; change it up with a piece of art. Sometimes a trip to the Powder Room can speak volumes about your house to a guest, consider wallpaper. Does your home to-do list look unmanageable or overwhelming? Sometimes as Nike would say, “just do it”… or you could contact a professional! We can help set your priorities and start the design process so that your to-do list melts away. After a hard season of traffic on your hardwood floors – the wear begins to show. Perhaps you are used to it but as a guest – the path most traveled in the house becomes very noticeable. Refinishing hardwoods is a daunting thought but the end result is very worth it. It is like getting a fresh coat of paint or new carpet. The other thing that happens is you get a chance to totally rearrange your rooms after the furniture returns! Love the new look! What a great way to kick off a new yar!